✔ DAY 01: DEPARTURE MANILA / ARRIVAL AMMAN (Dinner) Depart from Manila to Amman. Enjoy in-flight amenities while on board. Arrival in Amman. Meet and assist at Queen Alia Airport. Meet your Jordanian guide and drive to hotel for dinner and overnight. ✔ DAY 02: AMMAN (BLD) Breakfast at the hotel, board to your air-conditioned bus to Madaba, the city of Mosaic. Continue to visit Mt. Nebo, where Moses viewed the Promised Land before he died. Then, continue to your hotel for check-in, dinner, and overnight. 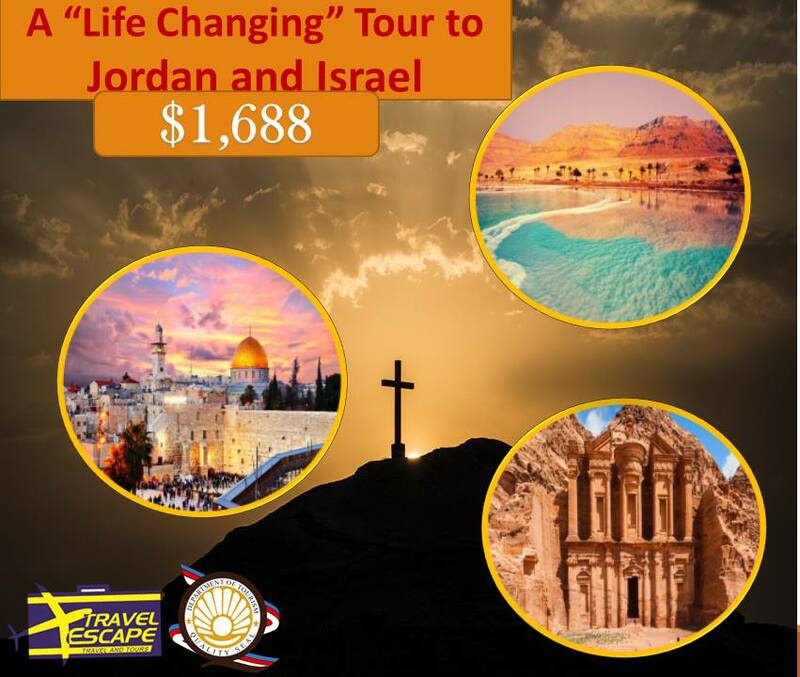 ✔ DAY 03: AMMAN – PETRA – AMMAN (BLD): After breakfast, Proceed to your full day tour to Petra, “a rose-red city half as old as time", the place in the desert that is prepared by God for the Jewish people. Also, experience horseback rides through the picturesque SIQ, and visit the Treasury, a rose-colored monumental building artfully carved out of sheer rock. Transfer back to Amman. Continue to the hotel for dinner and overnight. ✔ DAY 04: AMMAN – BORDER CROSSING – JERICHO – QUMRAN – DEAD SEA – TIBERIAS (BLD): Check-out from your hotel after breakfast. Drive to the border to cross Israel. Upon arrival Israel, drive to Jericho for a view of the Mt. of Temptation and the Sycamore Tree. Continue to Qumran where the Dead Sea Scrolls were found. Lastly, spend some time at the lowest point on Earth, the Dead Sea. Later in the afternoon, we will proceed to Tiberias for hotel check-in, dinner, and overnight. ✔ DAY 05: CANA – NAZARETH – MT. TABOR – YARDENIT – SEA OF GALILEE (BLD): Breakfast at the hotel. Morning drive to Cana for a visit of the Church of the First Miracle known also as the Marriage Church, where couples will have an opportunity to renew their marriage vows. Then onto Nazareth, the place where Jesus spent His childhood; the Church of the Annunciation which was believed to be where the angel Gabriel Announced to the Blessed Mother of Christ which she humbly accepted, "Behold I am the handmaid of the Lord. May it be done to me according to your word" and Mary's well. Drive to Mt. Tabor and ascend by taxi to the Church of Transfiguration. Descend after and proceed to Yardenit for renewal of baptism. Late afternoon, continue for a boat ride at the Sea of Galilee where Jesus' performed some of His Miracles like when he walked on the water (Mark 6:48). 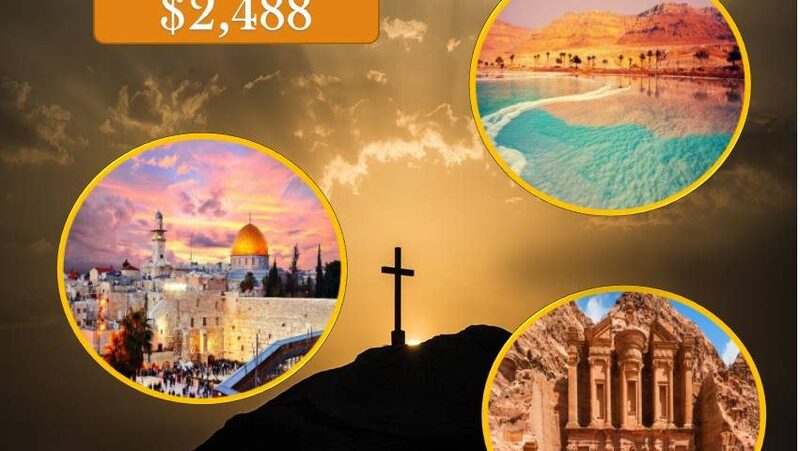 On the cruise, have an opportunity to reflect on the messages of our Lord as we savor the beauty of nature while sailing at the Sea of Galilee. Return to your hotel for dinner and overnight. ✔ DAY 06: MT. OF BEATITUDES – TABGHA – CAPERNAUM– JERUSALEM (BLD): Check-out from the hotel after breakfast and proceed to Mt. of Beatitudes, the traditional site where Jesus uttered the immortal words "Blessed are the poor in Spirit, for theirs is the kingdom of God". (Matthew 5:3-12). Visit the Church and its grounds for the private reading of the Sermon on the Mount. Continue to nearby Tabgha, the site where Jesus performed the Miracle of the Multiplication of Loaves and Fishes; visit the Church of the Loft and Fish Miracle. On the stone which serves as the altar, there is mosaic of a basket of loaves flanked by two fish to commemorate this miraculous event. Two hundred yards away is the Church of Primacy, built In 1934 in basalt over a massive rock called "Mensa Christi". Here where the Risen Lord appeared to his disciples, prepared breakfast for them and gave St. Peter the pastoral commission, Feed my Sheep (John 21:15-19). Next visit will be to Capernaum, the home of St. Peter. Proceed to the Greek Orthodox Church and the nearby archaeological excavations of the Synagogue and community. Scenic drive to Jerusalem for hotel check-in, dinner, and overnight. ✔ DAY 07: BETHLEHEM – EIN KAREM (BLD): After breakfast, we visit Bethlehem, the birthplace of Jesus and visit the Church of the Nativity, where we find the Grotto of Nativity, Altar of Christ's Birth and Manger's Square. In the afternoon, a tour of Ein Karem the birthplace of St. John the Baptist (now the Church of St. John the Baptist) and the Church of Visitation – where Mary came after the angel Gabriel informed her cousin Elizabeth was six months pregnant despite her advanced years. Return to hotel for dinner and overnight. ✔ DAY 08: JERUSALEM OLD CITY – MT. OF OLIVES –MT. ZION (BLD): After breakfast. Early morning proceed for a morning tour of Jerusalem’s Old City, starting from the St. Stephen's Gate (the Lion's Gate), stopping at St. Anne's Church – regarded as the birthplace of the Virgin Mary and the home of St. Anne and Joachin, the Pool of Bethesda, where Jesus told the lame man to take up his bed and walk. Reflect while following the Way of the Cross (Via Dolorosa) ending at the Church of the Holy Sepulchre – the burial place and resurrection of Jesus. It was built over the site of the place called Golgotha, which means "a place of a skull". In the afternoon, we will appreciate the Holy City of Jerusalem with a visit to the Mount Of Olives, for a panoramic view of the city, Ascension Chapel – traditional place where Jesus ascended into heaven; then Paster Noster Church traditionally the site where Jesus taught the disciples how to pray "Our Father"; then Dominus Flevit Church in memory of Jesus weeping over the fate of Jerusalem. Visit the Church of Ascension and walk the Palm Sunday route down the hill to the Garden of Gethsemane for an intercessory prayer; it was here where Jesus spent His last night before He was arrested; Basilica of Agony, stopping along the way at the Maria Magdalena Church. Visit the Church of All Nations at the Garden of Gethsemane. 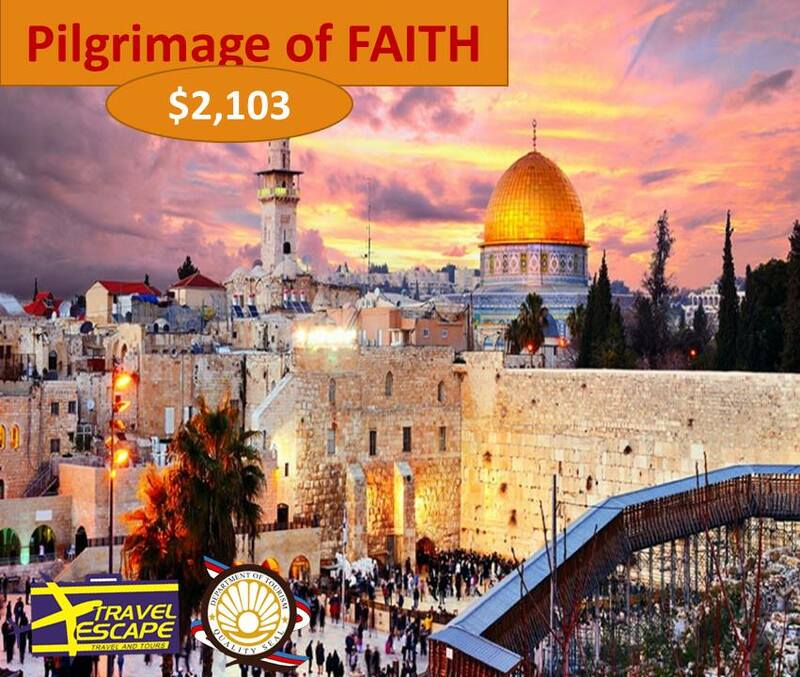 Drive to Nearby Mount Zion and visit the Last Supper's Room and the Tomb of King David. Visit the Dormition Abbey traditionally the site where the Virgin Mary slept last; and St. Peter's Church in Gallicantu – a traditional site where St. Peter denied Jesus for 3 times. Return to our hotel for dinner and overnight. ✔ DAY 09: BETHLEHEM – BORDER CROSSING – ST CATHE-RI (BLD): Check-out from the hotel after breakfast. Drive to Taba Border to cross to Egypt. Arrive at the Border. Meet your guide and driver after passport formalities. Transfer to your hotel in Sinai for check-in, dinner, and overnight. ✔ DAY 10: ST. CATHERINE – CAIRO (BLD): In the early morning, climb at the Moses Mountain and catch the sunrise (optional). Here is where God spoke to Moses. Then, back to the hotel for breakfast. Visit Saint Catherine Monastery. Check-out at the hotel then transfer to Cairo hotel for check-in, dinner, and overnight. ✔ DAY 11: FULL DAY CAIRO (BLD): After breakfast at the hotel, start your full day sightseeing visits, The Great Pyramids, which was constructed over 4,500 years ago and show us the power and wealth of the pharaoh in the Old Kingdom and Sphinx of Giza, which was believed to be a form of a Sun God and was worshipped in ancient days, Old Cairo including Church of Abu Serga, this is where the Holy Family hide, St. Sergius Church. Proceed for your Nile Dinner Cruise with Belly Dancing Show before returning to your hotel for overnight. ✔ DAY 12: CAIRO – MANILA (BL): After breakfast, visits at the Egyptian Museum, where you will find artifacts, relics, statues, and Jewelry from all of the Pharaohs that reign. Then transfer to airport for flight back to Manila.